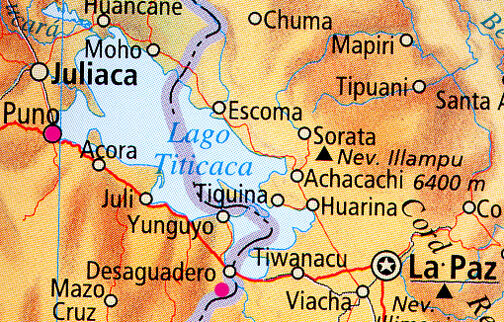 Not far from Lake Titicaca and Puno in southern Peru, is the small farming town of Carancas on a high Andean plateau near the Bolivian border (pink circle below Desaguadero). March 28, 2008 Providence, Rhode Island - It was 11:45 AM on Saturday, September 15, 2007, when alpaca farmer, Justina Limache, heard a “thunderous roar from the sky.” Scared, she grabbed her 8-year-old granddaughter and ran into her house. For the next few minutes, Justina heard rocks raining down on the roof so loudly that she worried her house would collapse. What 74-year-old Justina Limache did not know was that a meteorite had fallen near her home in Carancas, Peru, 62 miles (100 kilometers) southeast of Puno and not far from Lake Titicaca. Carancas is a farm community of about 2,000 people who raise cows, alpacas, llamas and other animals on the high Andean plateau near the Bolivian border.